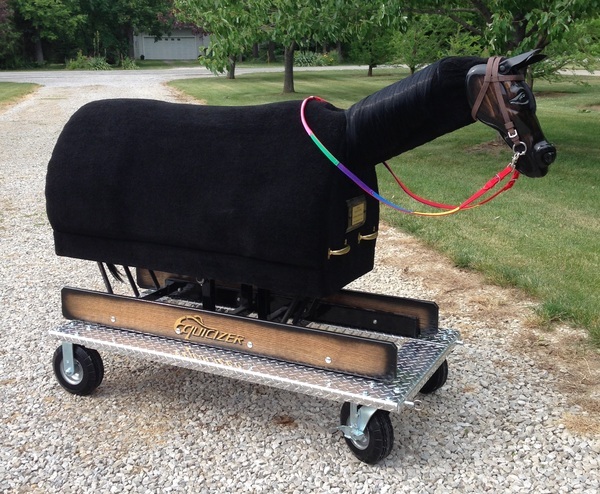 We are incredibly proud and excited to announce the newest Equicizer accessory: the Equicizer All Terrain Cart! Just in time for summer, this sturdy cart is just what you need to safely move your Equicizer out of the barn and into the summer sunshine! The Equicizer All Terrain Cart is ideal for programs and individuals who find themselves needing or wanting to roll their Equicizer across dirt, sand, stone, and grassy areas. The platform creates a sturdy mounting step that travels right with your Equicizer around your barn, yard, or home. 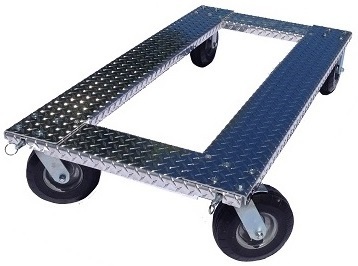 The wheels are able to be securely locked wherever you stop to prevent the unit from shifting around. The cart also provides a slight lift to the horse. Made with heavy duty diamond plate aluminum. Equipped with rugged, 8 inch foam filled pneumatic tires that will never go flat. Front wheels swivel and roll lock brake. Easy to mount or remove the Equicizer as you choose. Can be used for both the Elite and Classic model Equicizers. We are currently offering two assembly options with delivery. This is subject to change. Disassembled - Arrives completely disassembled and requiring assembly with tools. No additional charge, shipping & handling upon checkout $125. Assembled - Arrives as shown with wheels attached. Additional $75 fee. Total shipping & handling upon checkout $200.